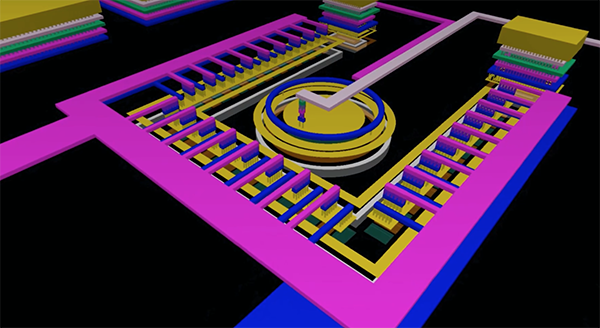 Scientists at the University of Twente (Netherlands) have created the first on-chip optical link to connect two parts of an electronics chip through a novel optocoupler circuit that can be integrated using standard chip technology (CMOS). The optocoupler, according to a report from the university, is only 0.008 square millimeters in size and delivers a MB of data per second with minimal energy consumption. Once that principle was proven effective, the researchers had to optimize energy consumption, speed, and space while also working through new details such as the voltage needed for the light detector and where to position the detector for highest efficiency. “The principle of data communication with light across isolated voltage domains is used in so-called 'optocouplers'. In optocouplers, light emitted by an emitter in one voltage domain is detected by a receiver in another voltage domain. “At present, only discrete optocouplers are available; however a discrete implementation increases the cost for PICs. Monolithic implementation of optocouplers without any additional processing (standard CMOS) would be a disruptive technology, enabling several new 'smart' PICs at lower cost and area requirements. Research on enabling these integrated optocouplers has been the focus of this research. “The main issue with the monolithic implementation of optocouplers is the absence of an efficient light source in CMOS technologies. Being an indirect band gap semiconductor, forward biased Si light-emitting diodes (LEDs) emit light at infrared wavelengths with low efficiency, while Si photodetectors (PDs) have a relatively low responsivity at those wavelengths. However, Si avalanche mode LEDs (AMLEDs) have a broad emission spectrum in the visible range which has a significant overlap with the responsivity of Si PDs. “Therefore, in this thesis, the use of AMLEDs is proposed for the monolithic implementation of optocouplers. Another issue however is that Si AMLEDs have a relatively low electrical to optical efficiency, also referred to as quantum efficiency. To compensate for such a low quantum efficiency, single-photon avalanche diodes (SPADs) in CMOS technologies are proposed for the light detection side. “In this research, firstly the physics of avalanche diodes is discussed in detail which is important to understand the performance of AMLEDs and SPADs. Further, AMLEDs with integrated driver circuits were designed in a 140 nm SOI CMOS technology. A low power LED driver circuit was demonstrated which is robust to many variations in the properties of the AMLEDs and the driver circuit operating conditions. The demonstrated integrated optical transmitter can be used to achieve a low energy-per-bit for the proposed optical links. Finally, for the first time, this research demonstrates a monolithic optical link with very low area requirements (< 0.01 mm2) in a standard CMOS technology. The data rates of a few Mbps at the energy consumption of a few nJ/bit are demonstrated.